Every article about healthy eating that you read will tell you that one of the most important factors in living a long and healthy life is the foods you eat. The typical article will push vegetables, fruit and exercise. And they are definitely right. They will also tell you that if you are eating grains you should only eat whole grains which still contain all of their vitamins and nutrients before being washed away in the processing. But in this article we want to boil it down to the most healthy foods that a person can eat in order to get the most nutrients one can. Eating these foods regularly as part of your ongoing healthy diet will certainly help most people to live a longer and healthier life. 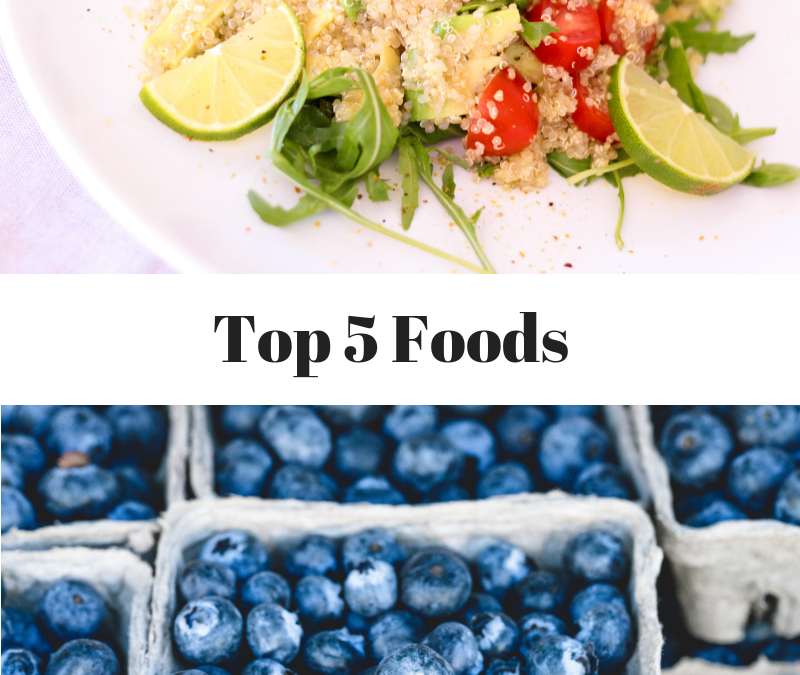 Not only that, but each of the five we have chosen, are not only among the healthiest foods that are easily available, but they are also extremely versatile. That means it is very easy to prepare and fit them into your regular menus. It will not be necessary to learn to cook all over again and taste things you’ve never heard of before. It’s just a matter of getting more of the right foods that have the right ingredients for your improved health! Another delicious and very healthy food is berries. Not only can they be easily incorporated into your meals, but they are great for a snack. All berries have antioxidants that are important for your diet. Cranberries, in particular, are very high in antioxidants, but all berries are benefitial and should be enjoyed often. All whole grains are far better to eat than processed grains. But quinoa is in a class of its own. Please note that by itself, quinoa has a bland taste, but you can fix that easily with some garlic, salt, lemon or oils. Better yet, just grab a few recipes off the internet and you will see that it is quite easy to jazz it up. It’s worth that extra little effort because quinoa is very high in fiber and in protein, and is an excellent source of magnesium and iron. Naturally filled with Omega-3 fatty acids, protein and other terrific nutrients, salmon is one of the best foods on the planet that a person can eat. This one grilled piece of fish has almost everything in it that your diet requires. And on top of all that it is low in fat and bad cholesterol, but high in good cholesterol. Quinoa makes a terrific add to everyone’s diet. As mentioned above, green vegetables are very important to your diet. And some of them can be important sources for calcium fiber, protein, and other important slices of the nutrition pie. Interestingly, spinach does not provide all the benefits that collard greens and kale do, but since spinach is easier to mix into your recipes and add to your menu in ways beyond a simple salad, we have focused on it over all other greens. By now, everyone has heard of soy. Unfortunately, this unique incredible food does require learning how to cook it. But it is so worth it. Soy is simply a fantastically healthy food. It has fiber, protein, Omega-3, calcium, vitamins, —almost everything a person could want from a meal. The good news is that soy can also be found in lots of foods, as vegetarians can find soy cheeses, soy meats, tofu and other things that can all be used to help you find ways to include soy in as many meals as you want. So there you have it! The Top 5 Food for Healthy Living. Bon appetite!